I have a difficult time relaxing. Anyone who knows me, reads this blog or has met for five minutes would probably say that bit of information is not breaking news. I've even showcased some of my attempts at calming myself down (bikram yoga, cell-phone free car rides, facials) in my year-long quest to do things that I've never done before. So far, I've succeeded only in completing each task, but never fully embracing its purpose, always returning to my over-thinking, often anxiety-ridden self. I'm told I hide it well and any nerves I may be feeling on the inside simply manifest th emselves on the outside as my upbeat, quirky personality. I don't know if I believe that, but in 29 years, I've learned to accept the fact that this nervous ball of energy is simply who I am. Still, I thought that at some point in the 10 days Maribeth and I were in Panama, I would find a way to decompress, disconnect and finally take a much needed deep breath from life. Unfortunately, though, since we'd landed, we'd been on the go. And I was constantly thinking about what we were going to do next, where we were going to eat, if we were going out how I was going to be able to blog. Granted, these are not big, important decisions, and Maribeth made most of them anyway, but the slowdown I had hoped for had not yet happened. On our last day, Day 218, I woke up in Bocas del Toro for the first time since we'd left to come on the trip, without any plans at all. No tour to go on, no cab to catch, no activities planned. Maribeth decided to go back to La Buga to dive again, and while I would have loved another surfing lesson/conversation with Chapo, I decided to stay behind and do nothing. Only doing nothing is not an easy thing for me to do. I was on vacation, I know, I should have done or not done whatever the hell I pleased, but I couldn't just lie around the hotel on my last day. I opted instead to take a walk, so I took a left out of La Coralina and headed away from town, to the less developed parts of Bocas. I had no plan, really, other than wanting to see if I could catch a glimpse of the filming of Ecuador's Survivor, but I never saw any of the contestants, just some of the props they use for competitions. I walked far and for a long time, taking my time and pausing to reflect on the trip. I felt lucky to have had the opportunity to travel to Panama for such an extended time and especially fortunate that I had someone in my life willing to travel with me. 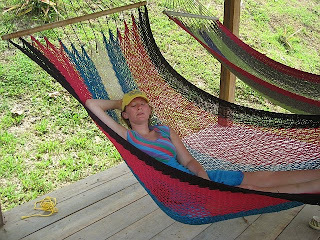 When I got back to La Coralina, I climbed the hill to a gazebo with three hammocks hanging underneath. They were shaded and there was a nice breeze coming off the water. I climbed into one to enjoy the view and then the next thing I know, Maribeth had returned from diving and was standing over me with her camera. Day 218's thing I've never done before was to prove to myself and everyone else that I am capable of relaxing, by falling asleep in a hammock. After getting up feeling completely refreshed, Maribeth and I grabbed some lunch, we napped, we played dominoes like senior citizens, and we drank our last rum punches at the La Coralina bar. Then went out for our last supper in Bocas del Toro. We talked about how much fun we'd had and how much we dreaded going back to our regular lives. After dinner, we headed out for one last night on the town. While we were surfing, Chapo had told me about La Iguana, a bar that hosts "Naaaaaasty Mondays" each week. The event sounded intriguing (especially the way he said it), and obviously I wanted to be wherever Chapo might be going, so we were all set to go. But while diving earlier that day, Maribeth heard that La Iguana was going to be closed, so we went back to the same place we'd gone our first night in Bocas. Unlike the first night, the place wasn't really crowded at all, but we met a group of guys from Holland almost immediately who were very nice. Young, but nice. I, of course, immediately started talking to one who was attractive, cool, and already in love with someone else. Holland dude and I sat at the bar and talked for several hours, about everything and nothing. As the night went on, I found myself in a super intense conversation with yet another stranger. We talked about work and what we wanted to be when we grew up. I told him that I really like my job because it's challenging and I really enjoy the people that I work with, but I'm not sure that what I'm doing now is what I'm supposed to do forever. He said he was getting an MBA and planned on working in finance. I told him I was single and I'm not sure if or when I'll meet "the one," but I am trying not to stress about it, though I confessed that it's a challenge not to sometimes. He said the girl he's been seeing for a year is definitely the one he wants to be with forever, and it's just a matter of time before he pops the question. We both agreed that we didn't have what it takes to trade conventional living for the Bocas lifestyle. I said I enjoy living in Atlanta, but miss living at the beach terribly, and I'm not really sure where I fit in the most. He said he'll definitely live in Holland for the rest of his life because that's where his family is. He, at age 23 seemed to understand a lot better than I do, at age 29, exactly what he wants, and exactly how to get it. Oh how I long for such clarity. A few years ago, I may have berated myself for not knowing what I wanted to do for a living, or not owning a house, or not having found a mate yet. But when I looked this guy in the eye and said with confidence, "You know, I'm a work in progress, and my life still has a lot of question marks," I felt peace like I've never experienced before. I've grown tremendously over the past few years, understanding who I am, who I'm not, what I want, what I don't want. But where I seem to have grown the most is in being okay with the fact that there is still a lot about myself that I don't know. And while this 23-year old Dutchman may have thought I should have all this sorted out at age 29, when I told him that I didn't, out loud, right there in the bar, I felt like I was giving myself permission to be me. Still uncertain, but always optimistic, me. And for the second time that day, this time in a crowded, hot, loud bar in the middle of Bocas del Toro, I could feel myself, once again, starting to relax. Just looking at these photos and imagining a cool drink in a hot bar calmed my inner nervous ball of energy, so you did something right. OUTSTANDING Stephanie! Not just the blog, but your insight. God has blessed you.